Just now this email came in to our support system that seamed like it was mailgun.com related. Since we use mailgun with jamroom it seamed related. It is a phishing attempt to try to collect a valid mailgun email account. 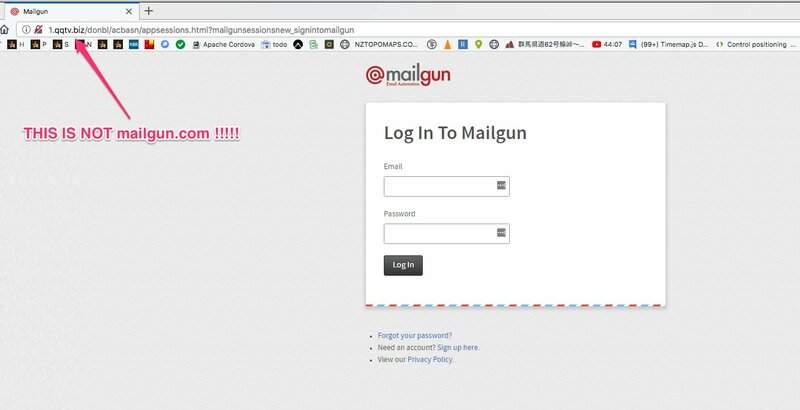 If you get an email that looks related to mailgun make sure you are at mailgun.com before putting in your login credentials. They have built a site that LOOKS like mailgun but is not. Make sure you only login to the REAL mailgun. If they're sending it to us, they're probably sending it to others too. I have received several of these as well. I've been getting several fake Mailgun support emails per week for the past month or two. Mostly asking me to click on a link to go 'verify my account', OR saying "action required" with some blabber about being unable to process my mail 'campaign' because my account was set to be suspended, and of course to 'click the link below' to log in to my (fake) Mailgun account. Never, ever, ever click on a link in an email to 'go to your account' with some company... not for Mailgun, Google, Paypal, banks, or credit cards etc. etc. The phony emails can look very authentic. ALWAYS instead go to your OWN bookmark or link to log into the company site fresh (or simply start from the main site to login, like Mailgun.com) if you feel the need to check whether there really IS a problem with your account ...as the email claims. Same thing goes for calling phone numbers sent to you from scammers disguised as your trusted secure site you have an account with. ...just another satisfied Jamroom customer.